I spent yesterday preparing for a class I am having this Thursday to introduce Stampin' Up! to a few ladies. I have a variety of things planned from beginner to intermediate level but this card is my favorite. Cased from a card created by Sandy Mathis, this card has so much texture and interest and it's so feminine! I love pretty things and to me this card just screams pretty. When I first started stamping over 13 years ago, one of my favorite techniques was collage stamping. 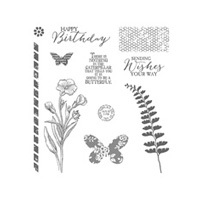 I had so much fun making this card and it came together so easily with the versatile botanical images from the stamp set called Butterfly Basics. Every image in this set has so much detail and there are three sentiments too. But, for me at least, the show-stopper of this card is the gorgeous butterfly. 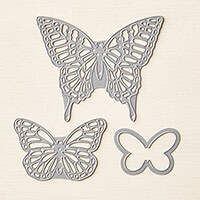 Created with the Butterflies Thinlits dies, I used gold foil paper and Blushing Bride card stock. Adhered together with a few mini glue dots and then topped by a rose from the Artisan Embellishment Kit. Who wouldn't love to receive this card in the mail? My hope is that my new "students" will enjoy making this as much as I did. Have a blessed week! Thank you for stopping by. Interested in learning more about Stampin' Up!? Contact me today for your private class.